I can almost hear the words as they would sound spoken in Timothy’s Caribbean cadence. Timothy’s an old friend of mine. So are Phillip and Stew Cat, the trio of castaways in The Cay. This is a book I’ve treasured since my childhood. I shared it recently with my boys, and I must give it a place of honor here on my blog. It is quite easily among the five best books I’ve read. Ever. It strongly, strongly influenced my decision to write in the middle grade genre. I’m evidence that the right book in the hands of the right child can have a lasting impact. I’ve been that child. Now I want to be that writer. Pretty impressive, eh? 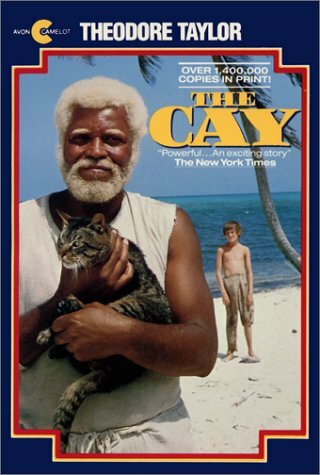 And in my opinion, The Cay should have at least won Newbery honors that year (although William Armstrong’s Sounder would have been very difficult to topple). I wish I could meet Mr. Taylor. I’d dearly love to talk to him, but he passed away nine years ago. For what it’s worth, I’m going to honor him and, in my opinion, his best work with a Squeaky Award. The Cay takes place at the outbreak of World War II on the tiny island of Curacao, a major supplier of gasoline for allied forces, where Phillip’s father has been called to oversee the refinery. When the Germans target the island, Phillip’s mother freaks out and attempts to return to America with her son. Unfortunately, the ship they sail on is torpedoed. During the chaos, Phillip is struck on the head by a falling beam and wakes up to find himself on a raft in the middle of the Caribbean with only Timothy, a giant black sailor, and a cat for company. He’s repulsed by Timothy’s ugly face and angry at his unreasonable stubbornness. Then his world darkens and blindness sets in. They land on a small cay far off the shipping lines. Without the benefit of his eyes, Phillip learns to “see” Timothy for what he is, an amazing man of wisdom, strength, and kindness. It is an extraordinary, heart-warming tale, one I would recommend to every single person with the ability to read. About a fifth to sixth grade independent level, it’s appropriate as a read aloud for children far younger. Mr. Taylor, your book has had a lasting impact. The Kindle version of The Cay sells for 5.99. It’s the best purchase you could make this year. This story sounds excellent. It sounds like it has a lasting impact. Have been to Curacao and have friends living there. I didn’t realize they were a major supplier of oil. Agreed. I read it and if I could, I’d rate it Infinite stars. You should definitely read this exciting, adventurous, and inspiring book. I have heard good things about this book. I too have been to Curacao and did not know its role in WWII. It is excellent. I’d love to go to Curacao! Well, well worth the few hours it would take you to read it, Erik. I love this book, too. It’s too often overlooked, I think, and I have gifted it several times–including to my dad, who served in the Navy’s Caribbean fleet during WWII. That is so cool, Susan. Thanks for sharing it! A totally agree with Michelle I. I read this in the 5th grade and it had a lasting impact on my world view. Recently shared it with my 4th grade daughter and reread it with “older eyes.” Still a great read some 40 years later and short enough to read in one sitting (maybe 2 hours). It’s still a very powerful book. I wish it got more attention these 40 years later. Thanks for stopping by, Bert!